Is It a Big Brochure or a Small Catalog? Need to target a specific group or audience for you next brochure? Informative brochures are a fantastic way to educate your customers about a specific function or product. By laying out the appropriate information, your customers will feel empowered to make the right choice. 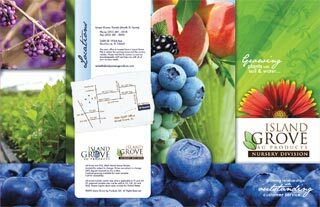 Island Grove Ag Products took full advantage of advertising their blueberries by providing an informative brochure to their audience. The large 11x17 half fold format serves as a small catalog of their products. By allowing their customers to read and compare the different varieties of blueberries, they can make an educated decision when choosing which berry will work best for them. Island Grove Ag Products is a blueberry farms in north central Florida who partnered with the University of Florida breeding program to grow their farm. Once they joined with the University of Florida, Island Grove Ag Products was able to expand production with experimental and new released varieties that could be tested under realistic growing conditions. The farm quickly grew and currently has 310 acres of producing fields and a nursery for native plants. Island Grove's customers are put at ease with this brochure once they open it and see the mission statement and the message of "let us help you succeed". Both these statements reassure the customer that Island Grove wants them to succeed in growing blueberries and will help them out every step of the way. Product Image - Close up images of blueberries throughout the brochure allows you to see the quality of the berries in great detail. Informative - This brochure is targeted to a specific audience looking for information on blueberries. The detailed "chill hour map" of Florida helps the reader determine which blueberries will work best for their location and growing conditions. 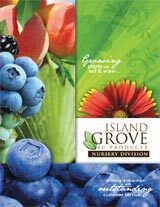 Island Grove extended the shelf life of this brochure by providing general information that will not change in the future. Paper - The designer chose 80# Gloss Cover to show the color-rich images off beautifully. This durable, heavy-weight paper was a great choice for this brochure since many will hold on to it as a reference guide. The designers used several techniques to display the food in this brochure. 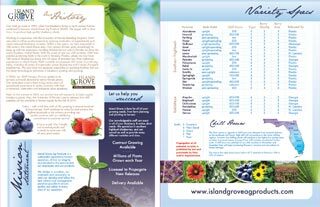 Format - The 11x17" half fold brochure allows the designer to provide the history of Island Grove and list all the blueberry varieties on the other side of the brochure without overcrowding the brochure details or layout. The chart is valuable for the reader to compare quality and "chill hours". Color - The use of vibrant colors on the front cover of the brochure draws the reader in, ensuring this piece will be read and reviewed. The contact information is displayed twice in this brochure. The website is placed inside the brochure at the bottom of the variety of blueberries inviting the potential customer to visit the site to get more information, such as price. The back page of the brochure was put to good use with more images of berries, contact information and a map making it easy for anyone to contact or visit them. The colors on the cover are extremely eye-catching and entice the reader to open this half-fold brochure. With information inside to help educate the reader, they are sure to hold on to this piece as a reference guide when choosing the type of blueberries to plant now and in the future. The different panels of the 11 x 17 brochure are used effectively.